The CARICOM Secretariat today announced the retirement at the end of November 2018 of Mr Tyrone Sutherland, long-serving Coordinating Director of the Caribbean Meteorological Organization (CMO). The Caribbean Meteorological Organization, established in 1973 with headquarters in Port of Spain, Trinidad, is one of the oldest Caribbean institutions. A member organization of CARICOM, the CMO coordinates the joint activities of the Meteorological and Hydrometeorological Services of 16 English-speaking countries in the Region. The CMO's training arm and its climate, research, and instrument centre is the Caribbean Institute for Meteorology and Hydrology (CIMH), located in Barbados. Mr Sutherland completes a 50-year long international career in meteorology that started in his native Saint Lucia back in 1968. He was one of two early meteorologists that led the development of the Saint Lucia Meteorological Service, which he headed until early 1982. He then spent the next 10 years as a Meteorologist and Severe Storms Specialist with the Meteorological Service of Canada. In 1992, he joined the World Meteorological Organization (WMO), the specialized United Nations agency located in Geneva, Switzerland, which coordinates global activities in meteorology, hydrology and related geophysical sciences. He worked there as a Scientific Officer in its Tropical Cyclone Programme, then as the Executive Assistant to the Secretary-General of that Organization. After resigning from WMO to take up this Caribbean post at CMO in 1999, he represented the Caribbean in WMO affairs and was elected by WMO as a member of its Executive Council, a position he retained until his retirement, becoming one of the longest-serving members of that council in the world. During that period, he served two successive terms as a Vice-President of the WMO, the second Caribbean representative to do so! In the Caribbean, Mr Sutherland will be remembered for leading the modernization of the Caribbean weather radar network that provides radar coverage of the region from Belize to Guyana. Under his leadership, the CMO has worked very closely with all the countries in North America, Central America and the Caribbean in ensuring that the region is served by a modern warning system for tropical storms, hurricanes and other severe weather. Mr Sutherland has been succeeded by Dr. Arlene Laing, a native of Jamaica. 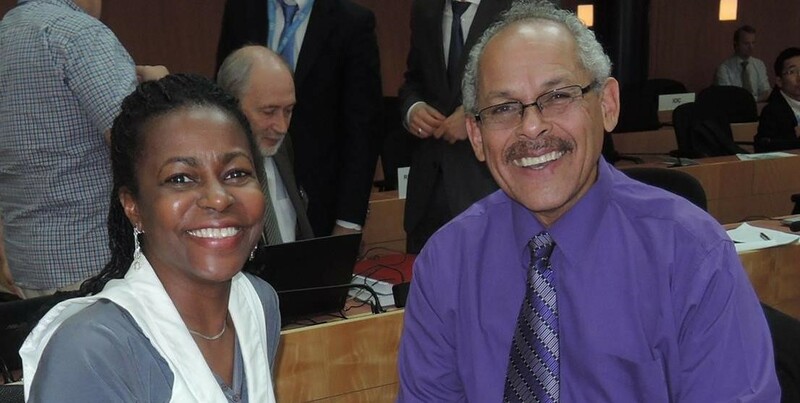 Dr Laing was selected by the Caribbean Meteorological Council, which is the Ministerial-level Governing body of the CMO, after an intensive international search. Dr. Laing has been a weather forecaster, a research scientist, a university professor, and a trainer in operational weather forecasting. She earned a bachelor’s degree in meteorology from the University of the West Indies, then completed a master’s degree and doctoral degree in meteorology from Pennsylvania State University in the United States. Prior to joining the CMO, she was a scientific analyst at US National Oceanic and Atmospheric Administration (NOAA). She also served as a project facilitator at the Weather Prediction Center of the US National Weather Service and spent several years as a researcher at the US National Center for Atmospheric Research (NCAR). She is the lead author of “Introduction to Tropical Meteorology”, a peer-reviewed online textbook, and co-author of the award-winning book, “Meteorology of Tropical West Africa: The Forecasters' Handbook”. Both Mr Sutherland and Dr Laing agree that the Caribbean Meteorological Organization has provided unity of purpose for its Member countries in meteorology and related sciences. The organs of the CMO will continue to provide scientific advice and guidance to the Caribbean in an era when severe weather, climate variability, and climate change issues are expected to be among the major challenges facing the region in the foreseeable future.